The Rangers extended qualifying offers to eight of their nine RFAs, choosing to let Conor Allen walk and become a free agent. Photo courtesy of MSG Photos. With the deadline to qualify restricted free agents ending yesterday, the New York Rangers sent qualifying offers to eight of their nine restricted free agents. The only RFA that didn’t get an offer was 25 year old defenseman Conor Allen. He will become an unrestricted free agent tomorrow, July 1st. Allen was a free agent signing by the Rangers out of UMass-Amherst in March of 2013. Since then, he has appeared in seven NHL games with, spending most of his time with the Hartford Wolf Pack. In his brief NHL career, he has no points, four shots on goal and a minus two rating. This past season with Hartford, Allen tallied 34 points (11-23-34) in 72 games. He also added a goal and an assist in 12 playoff appearances. Allen is a solid defenseman, so it’s odd to see him go unqualified, but he has the disadvantage of being a left-side defenseman. On that side, the Rangers have Ryan McDonagh, Marc Staal and Keith Yandle in the NHL, with other left defensive prospects in the organization. Unfortunately, the Rangers don’t really have much of an opportunity for Allen, and are looking elsewhere. Allen is a quality prospect, and I’m sure he will get snatched up soon. The Rangers did extend qualifying offers to eight of their RFAs, those being Derek Stepan, JT Miller, Jesper Fast, Emerson Etem, Oscar Lindberg, Marek Hrivik, Dylan McIlrath and Mat Bodie. Derek Stepan is arguably the most important, and is slated to get a raise from his $3.8 million salary, which is a $3.1 million cap hit. JT Miller, Jesper Fast and Emerson Etem are also very important, as they’re going to be counted on to fill out vital depth spots in the Rangers lineup. All three should make just over $1 million, which will certainly benefit the Rangers’ cap situation. 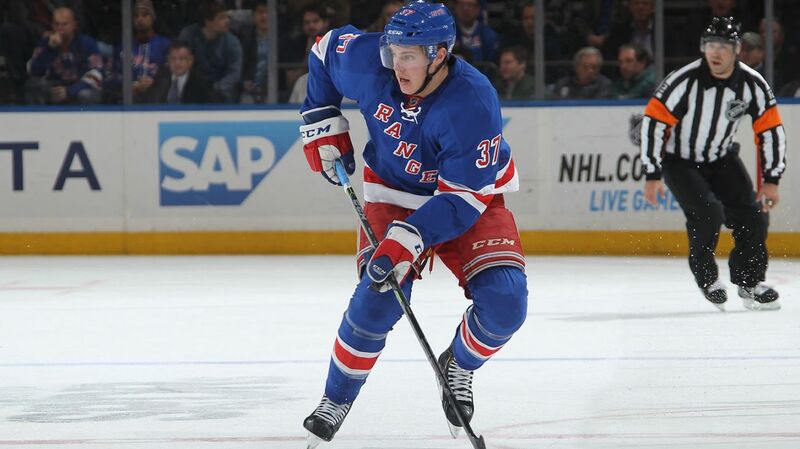 Oscar Lindberg could be a big factor as well, with Vigneault looking for affordable and effective options for the bottom-six. Lindberg could play third-line center, and play with long-time teammate JT Miller on one of the wings. Lindberg would make less than $1 million, and is definitely ready for the NHL. McIlrath and Bodie earned the praise of the coaching staff in Hartford, especially Jeff Beukeboom, who works with the Wolf Pack defenders. Beukeboom said that McIlrath has been a much improved player since December, and benefitted from finally playing a full, healthy season. Bodie has a huge offensive upside, totaling five goals, 27 assists and 32 points in his first AHL season. But at 6 feet tall and just 160 pounds, he needs to add bulk to his frame. Posted on June 30, 2015, in Rangers Updates and tagged Conor Allen, Derek Stepan, Dylan McIlrath, Emerson Etem, Etem trade, Hartford Hockey, Hartford Wolf Pack, Mat Bodie, New York Rangers, New York Rangers blog, New York Rangers prospects, NYR, Oscar Lindberg, Rangers, Rangers blog, Rangers prospects, Rangers rookies. Bookmark the permalink. Leave a comment.